What’s going on inside Sean Spicer’s gum-filled body? 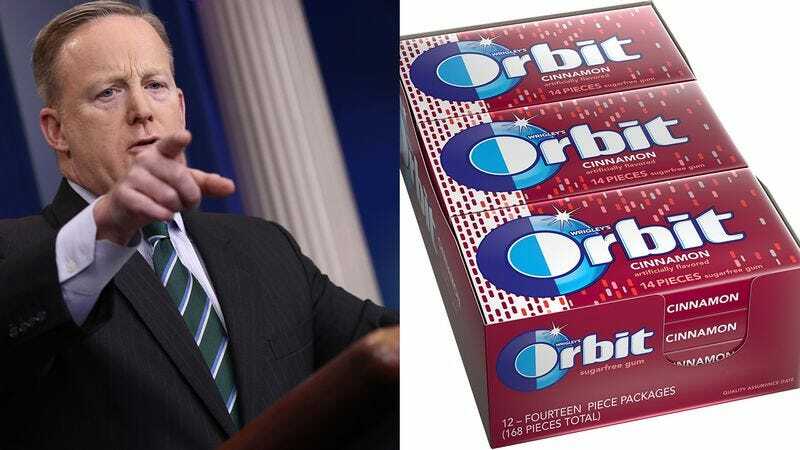 Sean Spicer is obsessed with Orbit’s cinnamon-flavored, sugar-free gum. Melissa McCarthy latched on to that detail in her Saturday Night Live performance as Spicer, where she dumps gum pellets into her mouth and spits out a big wad to save for later. Even when he is not speaking, [Spicer’s mouth] works on overdrive, churning through pieces of Orbit cinnamon gum, which he chews and swallows whole. Notwithstanding his line of work, the man just can’t stand a gross-feeling mouth. Did his doctor also tell him he’s doing gum wrong? Eating two and a half packs of gum by noon (how many more after that?) raises the question of what exactly happens to all that gum. Unless swallowing your gum is a plot point of a Magic School Bus episode—and Arnold swallows his gum by accident, like most scenarios of gum-swallowing—gum is supposed to be spit out. It’s not a foodstuff. Vox rounded up some of the research about swallowing gum and determined that, yeah, you’ll basically poop it out. What’s more interesting is that the ingredient that makes gum sugar-free, sorbitol, has been shown to cause chronic diarrhea in some people. Vox links to two case studies finding that sugar-free foods and gum were responsible for people losing weight because of diarrhea. A woman who chewed about 16 sticks of gum a day, for example, produced seven times the normal amount of stool. When she stopped chewing the gum, her symptoms disappeared. Plain old sugar must be better than sorbitol, right? The woman profiled above just chewed gum. Spicer eats it, and in greater quantities than the woman who had such bad diarrhea she lost weight. Maybe the sorbitol doesn’t affect him. Maybe it does. Either way, spit out your gum, dude.